A slow and progressive work through which Daniela Boni developed her personal style of ambient design-elegant, essential, minimal and at the same time open to suggestion and contaminations from art and music. Her in depth knowledge of the materials renders her inspiring art craft designer. In 2002 she organised her first solo exhibition in the Adelinquere Gallery. In 2005 took a part in the ‘Alta Gradazione’ exhibition at the Palace of the Counts Botton di Castellamonte with the piece Planetarium con il Razzo (Planetarium with rocket) which subsequently was acquired by MIAAO (International Museum for Craft Arts Today)in San Filippo Neri Turin where it is permanently exhibited. In 2007 she is the curator of the exhibition ‘Super Craft Super Gift’ at MIAAO museum of applied arts in Turin, next she is the curator of the exhibition of contemporary jewellery ‘Eclectica’ at CATARTICA art gallery in Turin. Since 2012 she is in charge of curating the exhibition at the exhibition space MADE FOR LOVE in Turin . 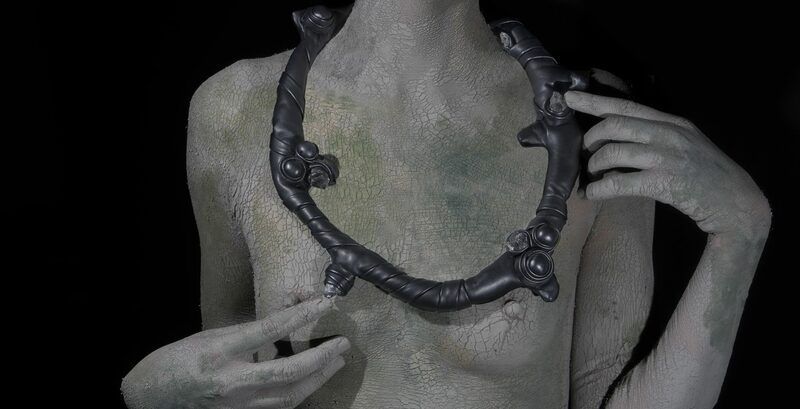 Daniela Boni presents now ORIGO, her first sculptural ornaments collection . ORIGO the basic principle for which something originates, the beginning of life, the start of the Universe, the Source. Origin is the leitmotif of the whole Collection, inspired from Mother Nature’s most intense and essential form. In this representation trees’s cortex turns into leather, the gems into buds , sprouts and shoots, tangled roots,to adorn, praising powerful Mother Earth. In the beginning it was Metal, shaped in basic cellular forms such as the Circle, the Egg, representing life and its cycles. Moving backwards through Material and thus reaching the principle of it, Metal gets back to Mineral, to Stardust same ingredient Man is made of. 2018 _ AUTOR Fair _ Bucarest_ Romania. 2018 _ SIERAAD Fair _ Amsterdam_ Netherlands.